With the mercury hitting south in our part of the globe, our kitchen smells of sizzling pots of soups, rasams and dals. Sizzling bowl of soup with warm bread straight from the oven or steaming cup of rice with hot Rasam/Dal is what we crave for. After my successful attempt at making Thai Curries, I was keen to learn and cook something new. Thai food is greatly influenced by its neighbours, India, China, Malaysia and Laos. No wonder our Indian taste buds start singing and dancing when tasting Thai food, an explosion of salty, spicy, sweet and sour flavours that sparkle with personality. The four main Thai flavour groupings are salty (from fish sauce), sweet (from coconut and palm sugar), spicy (from dry and fresh chillies) and sour (tamarind, lime, lemongrass), with the less used bitter as a fifth primary flavour. These five primary flavours are the characteristics of Thai cooking, something to touch and delight every taste bud. As I said in my earlier post, don’t get intimidated by the unfamiliar ingredients used in Thai cooking. There are good substitutes available which you can use if few ingredients are not available in your local shop or you can omit those ingredients which you are not very fond of. And more importantly, don’t be afraid to make changes to suit your taste. While cooking Thai food at home, we found that the food tasted much better than the one from local Thai restaurant. And why it shouldn’t, with freshest of fresh ingredients used, homemade curry pastes and spices made a whole difference. You will never get to see the liberal use of fresh ingredients in any restaurant as at home. Many people shy away from cooking Thai food under the misconception that it takes lot of time and ingredients which are unfamiliar to them. Something magical is created when you cook Thai food or any foreign food over time and the ingredients which were aliens in the beginning become more familiar. I find the time consuming dishes more rewarding. Believe me when I say it is as close as meditation when you get to use mortar and pestle and pound out day’s anxiety. Armed with our new acquisition Real Vegetarian Thai by Nancie McDermott to our empty cookbook rack we tried two Thai clear soups, Tome Yum Soup with Mushroom & Tofu and Jasmine Rice Soup with Mushrooms, Green Onions & Crispy Garlic. 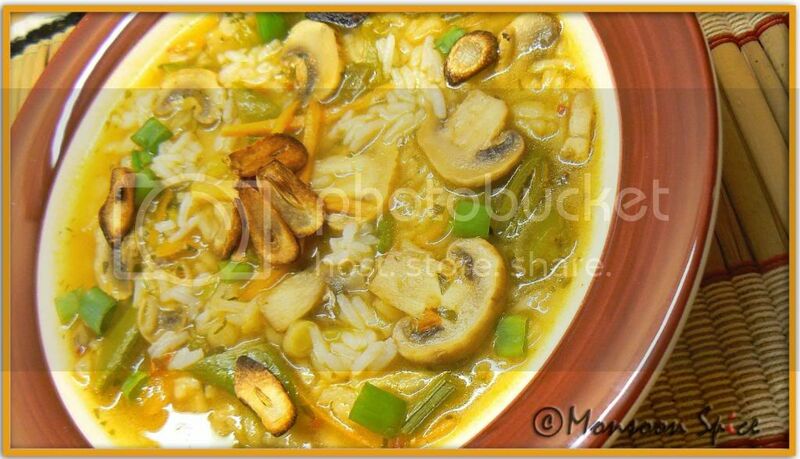 As author says, “Soup is an essential component of almost every meal, served and savored along with rice and its accompanying dishes. In keeping with Thailand’s Chinese culinary ancestry, soup functions as a beverage, a liquid refreshment that cleanses the palate between bites and makes way for further rides on roller coaster of tastes that make up a classic Thai meal.” Most of the Thai Vegetarian recipes are also perfect for Vegans and I thought these soups will be a perfect entries for this Vegan Month. These two Thai Clear Soup goes to Suganya's Vegan Ventures Event. And I totally agree with her. 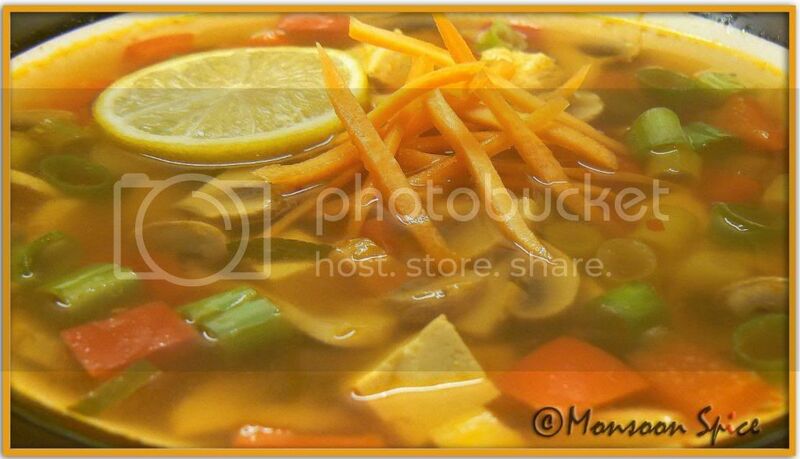 This delicious flame-colored broth studded with green herbs and vegetables with exotic citrus perfume is a pure delight to one’s senses. Serve hot with a bowl of jasmine rice and enjoy its healing power. In a large pan bring vegetable stock to boil over medium heat. Meanwhile, trim the lemongrass stalk by removing upper hard, dried skin leaving smooth stem. Cut the stalk into 2 inch pieces and lightly bruise the stalk with pestle and mortar. Add bruised lemongrass , 3 kaffir lime leaves strips, galangal to boiling stock and reduce the heat to low. Let the ingredients simmer for 5-8 minutes till lemongrass stalks turn into khaki green and nice citric aroma fills the room. While the soup simmers, combine spring onion greens, 2 kaffir lime leaves strips, green chilli slices and lime juice and place them into serving bowls and keep aside. Scoop lemongrass stalks, galangal from vegetables stock and discard. Add tofu, mushrooms, carrot, bell peppers, basil leaves, sambal olek, soya sauce, sugar, spring onion and salt to taste and increase the heat to high. 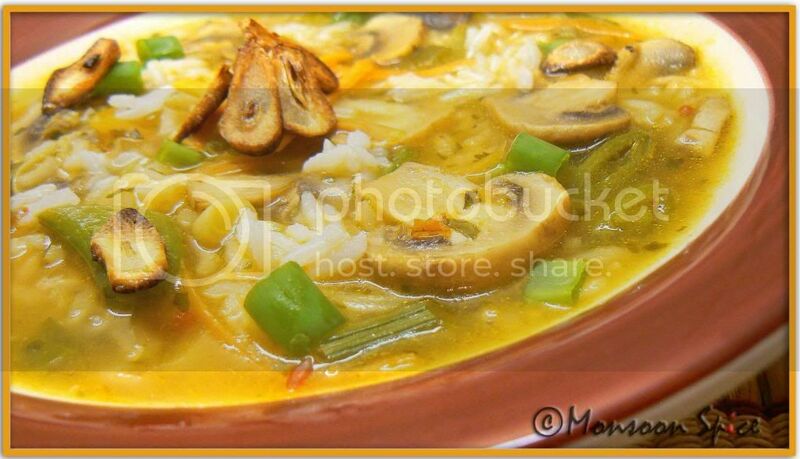 When the soup boils again, remove it from heat and pour it on serving bowls and serve at once with Jasmine Rice. Nancie says, “Rice soup is comfort food in Thailand, simmered up from leftover rice to nourish a family member who is ill. It is also popular as a hearty breakfast or midnight snack. Cold, fever, aches, hangover and heartbreaks all seem to soften their edge just a little when a generous steaming bowl of Kao Tome appears.” And how can we not try this soup which claims to have medicinal properties and can be served as one-dish meal to satisfied our taste buds. We omitted Wheatballs or Wheat Gluten which the recipe calls and made few changes to suite our taste. In a blender, combine 1 tbsp garlic, pepper, coriander roots/stems with little vegetable stock and grind to smooth paste. Heat vegetable stock in a pan and mix in ground paste over a low flame. Add bruised lemongrass stalk, sliced galangal if using and bring the stock to boil in low flame. Meanwhile, deep fry or pan fry sliced garlic pieces till they are crisp and golden and transfer to paper towel till required. Heat 1 tbsp vegetable oil in a pan and add mushrooms. Toss them for about 3-5 mins until they are shiny and tender and keep them aside. Discard lemongrass stalk and galangal from vegetable stock and add sautéed mushrooms, carrots, sugar snap peas, sugar and salt to taste and cook for further 5-8 minutes over low heat. Add cooked jasmine rice, spring onions and cook for further 5 minutes. Serve hot or warm soup garnished with crisp fried garlic and coriander leaves and enjoy this one-dish meal. Also Check Jugalbandi’s Thai Pantry. 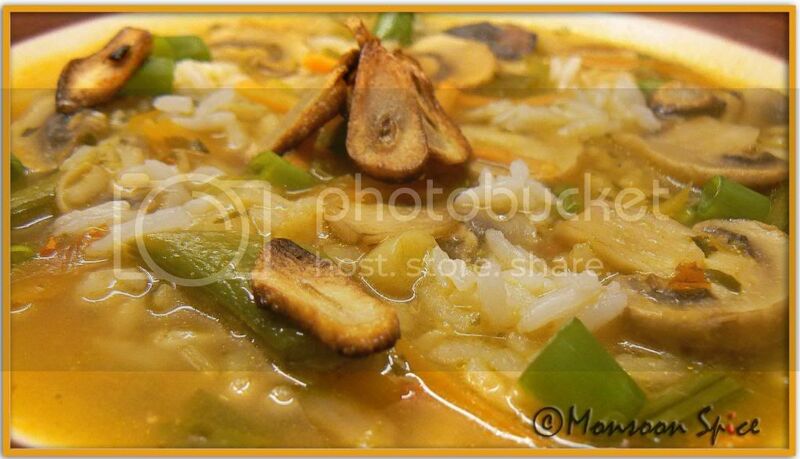 You are right about the mercury dipping :( but after taking one look at your soup I am starting to get perky. Looking at those soups have already warmed me to a great extent...lovely. Sia, loved your analogy of feeling refreshing after cooking and meditation. Even I have felt that wholesome experience while cooking and tasting soups. I commend you for trying out so many new varieties of cusines and as usual the clear soup looks wonderful and it is a co-incidence that I have posted a soup recipe as well. this sounds like a great book with very accessible recipes. we plan to made tom yum soup soon. Both the soups are really yummy! would love to try these! more so, because these days, i am in a bread-n'-soup mode :-D.
That does look very comforting. A complete meal in a bowl. Ooo, Sia! I just bought Nancie's cookbook a few weeks ago - absolutely love the recipes there! wow! those look lovely. but then again, there is a considerably long list of ingredients involved, right? :) still, it looks very warming for winter! Those soups will definitely keep me warm throughout this winter. Never tried thai soups but now i am gonna give them a try!! Hey few more days for your holiday, bet you must be so excited!! this book is really good with few notes and tips. my only prob with it is you need to check different pages as the listed ingredient's recipes are noted in different pages. so while cooking u need to jump from one page to other but other than that its got clean flow. u r welcome dear:) tome yam soup is my fav too and it tasted better than what we get in restarants here. oh! have u? did u try any of the recipes there? yesterday i tried one of the rice dishes. will post the recipe soon. Great soups for Winter, it's raining here today, foggy for a change. I have that book too, haven't tried it yet. Enjoy your soups, I like the clear soup. Sia, you made cooking Thai food so simple!, will try out these lovely soups definitely. Thai Queen! You simply amaze me with your thai dishes. Just perfect. My hubby would love this. Thankyou so much for sharing this. I love Tom Yum Soup... perfect for this weather. Both look amazing Sia. I have all the ingredients (except kaffir lime leaves) on hand. And it sounds so easy. And, thanks for the book recommendation, Sia. Thank you so much for participating. wow, nice soups Sia! I prefer the Tom Khai Gai more, as it's coconut-milk based, over the Tom Yum..but I really liked your other one with jasmine rice:) will try it soon! Tom yum yum soup! :) They're both lovely, Supriya. Can almost catch the aroma from here! Hey, these look so yummy!!!! Weather is getting really cold at my part of the world too.. And I'm def gonna try these out. Thanx for sharing! Love the clear soup....yum yum!! Looks superb sia!! 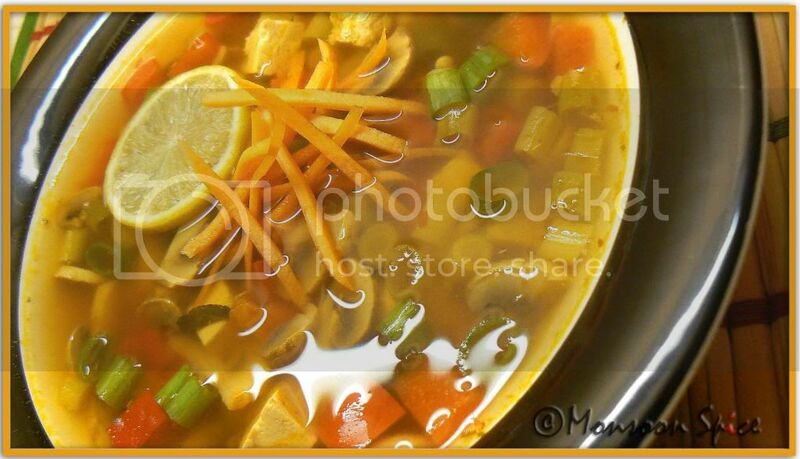 !Thanx for sharing this wonderful soup recipes!!! Fantastic looking soup!!! I liked one with Jasmine rice. Lovely presentation. Thanks for sharing. LOL… You might offend the real thai queen now kribha dear;) so ur hubby loves thai food han? U can omit kaffir lime leaves and make this. It won’t make much difference. Add lemon peel/zest and see how u like it. Thats such a nice soup Sia. I am great fan of Thai dishes but hubby does not like them. So we almost never go to Thai restaurants. Now with your recipes I think I can cook them at home too. Thanks a lot. 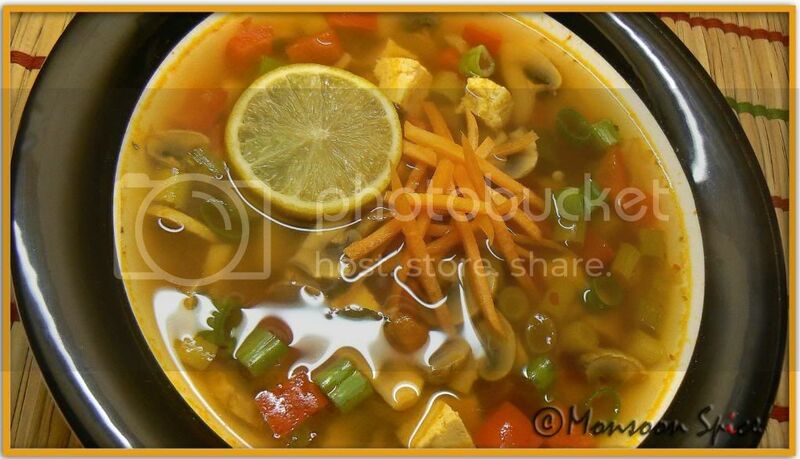 Haven't tried clear soups .. Ur picture of thai clear soup looks sooooooooooo lovely ,that it has kindled my taste buds.. will try it soon. thanks. lovely pics. Still enjoying at my sister's place...will be back to home on Dec1st. Lovely pictures! :) I liked the clear soups served in Bankok! This looks similar. But I dislike the taste of mushrooms! Am a fellow blogger from Botswana and am a cake lover.